The Ubiquiti Rocket M2 Titanium features enhanced radio perfomance and superior durability. The Rocket M2 Titanium has carrier-class capabilities that can link distances up to 50+ km and provide breakthrough speeds of up to 150+ Mbps. 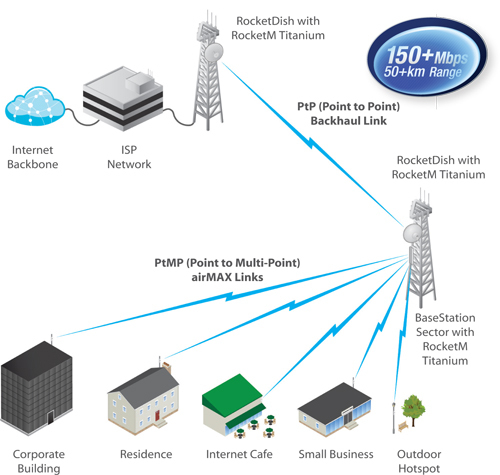 The Rocket M2 Titanium takes advantage of its Gigabit Ethernet connection to deliver high throughput for reliable data transfers. The RocketM Titanium enclosure was specifically designed to improve performance in harsh RF environments and in extreme weather conditions. 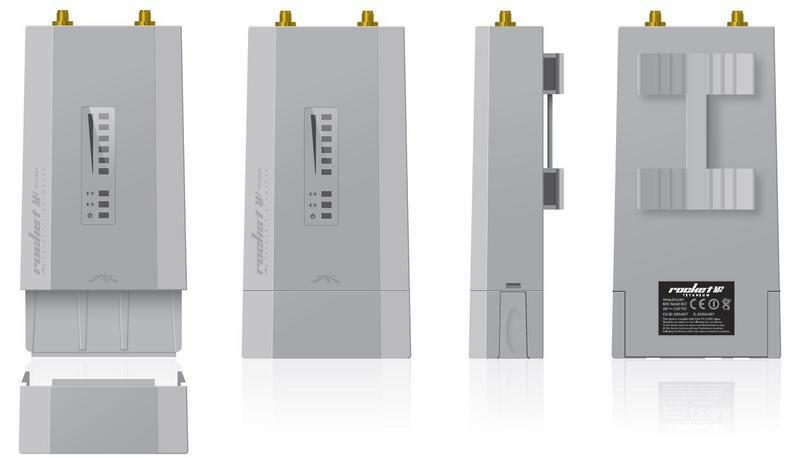 Enclosed in aircraft-grade aluminum, the Rocket M2 Titanium is a rugged, high-power, linear 2x2 MIMO radio.Rocket devices may be deployed in PtP bridging or PtMP airMAX BaseStation applications. They can be paired with your choice of airMAX BaseStation™ Sector or RocketDish™antennas. This versatility gives network architects unparalleled flexibility and convenience. طب ايه شكل الانتنا اللى بتركب عليها؟.. The Ubiquiti airMAX Titanium Sector is a 2.4GHz Variable Beam Sector 60-120 Deg Antenna specifically engineered for optimal performance when paired with a Rocket™M Titanium. Drawing on Ubiquiti’s depth of electrical and mechnical engineering expertise, Ubiquiti has developed the airMAX Titanium Sector to be highly resistant to noise interference in co‑location deployments. 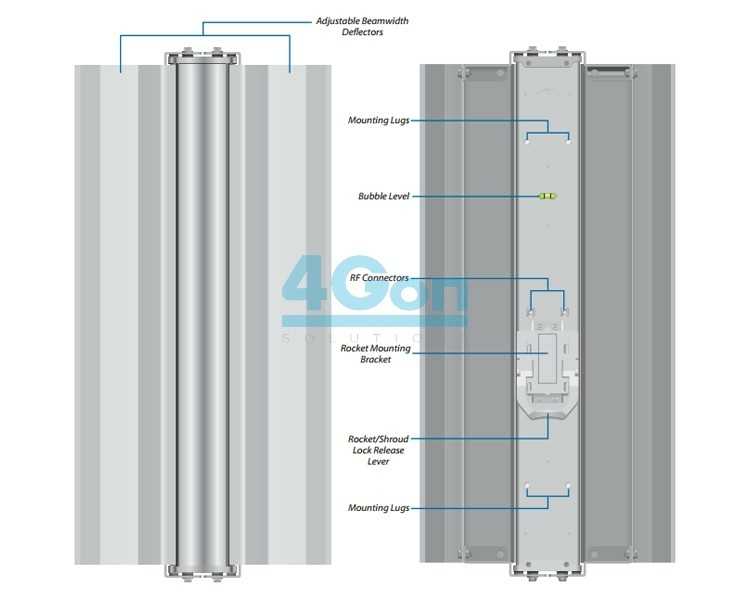 Having adjustable beamwidth options enhances scalability and streamlines inventory. The airMAX Titanium Sector may be custom configured for any deployment requiring a 60˚, 90˚, or 120˚ sector. Antenna gain increases respectively with each decrease in beamwidth. Gain is 19 dBi at 120˚, 20 dBi at 90˚, and 21 dBi at 60˚.